Certified to meet European Standard EN795:2012 Type D.
Marine grade aluminium alloy cars, track rails and end stops, anodised for corrosion protection and long service life. Recirculating Torlon® ball bearings for free running, low friction performance and low maintenance. Grade 316 forged stainless steel pivoting shackles for lanyard attachment. Rubber buffers for reduced vibration and to lift pivoting shackles away from car body for quick access. Spring-loaded stainless steel plunger for simple, positive re-positioning at stop locations. Can be locked in the disengaged position to allow free movement along the track rail. The elliptical knob is easy to grip and turn, and indicates clearly whether the plunger is engaged or not. 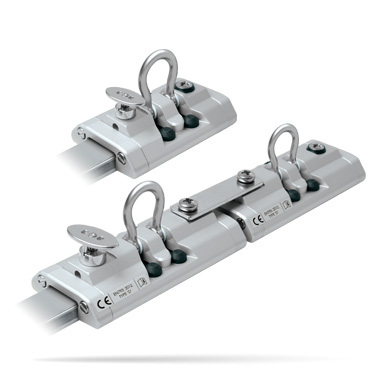 The track rail can be mounted in either a vertical or horizontal plane. Track and car systems have long been used to provide a mobile attachment point for crew when cleaning the hull, superstructure and windows of large motor yachts and other vessels. With today’s greater awareness of workplace risks, boat builders and surveyors are seeking to ensure a high standard of safety by specifying systems that are purpose designed, tested and standards approved. Ronstan supports this approach, which can only improve the safety and security of the persons using these systems in their everyday work, and has developed safety rail systems which have been tested and certified by Lloyd’s Register to meet European Standard EN795:2012 Type D.
This system provides a method of attachment for use in conjunction with personal protection equipment to protect against falls from a height, such as when working outside of conventional guardrails for cleaning and maintenance purposes. It shall not be used for lifting equipment or for any other purpose.